Fo those buying a Nintendo 3DS XL that don't already have a power supply/adapter, get one from Argos for the princely sume of £6.99! Same price as Nintendo website, but you don't have to spend £20 for free delivery. I bought one last week from Tesco direct for £6.50 delivered to my local store. Can't believe how much the price of these vary. Is it true that using anything other than an official Nintendo charger voids your warranty? If so, how would anyone be able to tell? Is it true that using anything other than an official Nintendo charger … Is it true that using anything other than an official Nintendo charger voids your warranty? If so, how would anyone be able to tell? Suppose this will work on the 2ds as well? 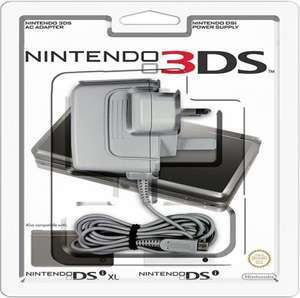 I bought one of these when I first purchased my 3DS, they're bulky as heck. I'd recommend investing in one of these Micro-b to 3DS adapters so you can just use a phone charger cable. I bought one of these when I first purchased my 3DS, they're bulky as … I bought one of these when I first purchased my 3DS, they're bulky as heck. I'd recommend investing in one of these Micro-b to 3DS adapters so you can just use a phone charger cable. ​So instead of having the bulkiness at the transformer end, where it doesn't matter, you have that big ugly lump at the 3ds end? No thanks. Bought one of these £3.49, it's never let me down. about 30p cheaper in Sainsburys if you are passing. Gone for this thanks for recommendation! £6.50 @ tesco direct. Just picked one up last week when my son cut the wires. Free click and collect. Get a USB Charging Cable instead, way more versatile. Under £3 on Amazon. Best purchase I made for my 2DS. ​So instead of having the bulkiness at the transformer end, where it d … ​So instead of having the bulkiness at the transformer end, where it doesn't matter, you have that big ugly lump at the 3ds end? No thanks. Did you even click the link? It's tiny....though I guess maybe it's good that you think something so small is big. Protip: Get a USB DS charger instead of a mains one. You can then plug it into any USB charging port or battery pack, much more useful when travelling. eh? its always this price at argos. its like saying "much cheaper than sending it once round the moon" just go there in the first place. heat!!!!!!!!! heat!!!!! Was forced to get one of those months ago thanks to Nintendo's exorbitant price hike on chargers. Does the job well. Just grab a USB compatible cable from Amazon or eBay, that will make your life much easier! Will this work with the Nintendo switch ? They've been this price in Argos for months and months. I have one in a deal with my New 3DS XL that I traded in to CeX for a tenner store credit, would rather use USB, to echo what others have said. Same for my Wii U gamepad which I also replaced with a USB charger. The less things that use mains sockets in my house the better. The USB ones have the same amperage as the mains one (checked with a USB multimeter) so they charge just as fast too. Will this work with the older ds consoles not xl etc? Seconded, it's super convenient to have a 3DS charger that plugs into USB. Bit concerned about the 1 star reviews of the USB cables. Has anyone else had issues with them, such as only charging when the 3DS is not in use, cables being loose etc.? Can they tell? Probably be not, as I think it would be public knowledge by now, but it's easy to implement such a system. I'm honestly bemused by the comments in this thread and people going with cheaper chargers for a system that has been sold at £230 for the limited editions (XL). £7 is not expensive for something that can kill you if not constructed properly. If you have good USB chargers around, then a USB cable is also another option, although again, technically invalidating your warranty. Yes it is true, Nintendo chargers give out a certain amount of charge that none of the other cheap, badly made ones can. With that, they can tell how much the battery has had in its life time and can tell if you have used a genuine charger or not. Thought this was the standard price. Never paid more for one. Just RRP, not really a deal. Any chance of the 3DS (XL) going on sale before Xmas? It feels like Nintendo would rather we save our money for the Switch. Wrong.Nintendo released a statement over 2 years ago making it very clear … Wrong.Nintendo released a statement over 2 years ago making it very clear that any unlicensed charger voids the warranty. This is from their warranty information:Can they tell? Probably be not, as I think it would be public knowledge by now, but it's easy to implement such a system.I'm honestly bemused by the comments in this thread and people going with cheaper chargers for a system that has been sold at £230 for the limited editions (XL). There isn't a week go by where there hasn't been some battery or charger set on fire. Last week we had another warning about fake chargers: http://www.bbc.co.uk/news/technology-38167551£7 is not expensive for something that can kill you if not constructed properly. If you have good USB chargers around, then a USB cable is also another option, although again, technically invalidating your warranty. In defence, no one has really said they're using a cheapo mains charger like in the article. It's generally not the cables that are at fault for these fires but the USB wall plug. Whilst that's not a 100% guarantee (nothing is, not even branded ones) if you use a safe, branded USB wall charger there's very little to go wrong providing you don't go and get yourself the cheapest USB cable with no quality control from China or eBay. I spent £180 on my 3DS XL and I appreciate it's an expensive bit of kit (especially for what it is) and I wouldn't risk it if I wasn't confident it was safe. As mentioned, I've tested the amperage output of the ZedLabz USB charger for the 3DS and it perfectly matches that of the USB mains. I would argue that there is no possible way Nintendo are able to tell, but I can't be certain. Either way, mine's been through loads of charges without issue and it safely stops charging when the capacity is full. I feel safer having replaced as many mains chargers as I can with (safe!) USB chargers. Saves me having to use endless amount of multi socket extensions. The ZedLabz one works great. There was another one linked in the thread (the £1 odd one) that has a 1* review saying it broke the user's charging port - I fully agree that buying something with a review like that would be silly and an unnecessary risk. In defence, no one has really said they're using a cheapo mains charger … In defence, no one has really said they're using a cheapo mains charger like in the article. It's generally not the cables that are at fault for these fires but the USB wall plug. Whilst that's not a 100% guarantee (nothing is, not even branded ones) if you use a safe, branded USB wall charger there's very little to go wrong providing you don't go and get yourself the cheapest USB cable with no quality control from China or eBay.I spent £180 on my 3DS XL and I appreciate it's an expensive bit of kit (especially for what it is) and I wouldn't risk it if I wasn't confident it was safe.As mentioned, I've tested the amperage output of the ZedLabz USB charger for the 3DS and it perfectly matches that of the USB mains. I would argue that there is no possible way Nintendo are able to tell, but I can't be certain. Either way, mine's been through loads of charges without issue and it safely stops charging when the capacity is full.It should have been a USB cable to begin with really, and it should have been included in the box, but that's another argument :pI feel safer having replaced as many mains chargers as I can with (safe!) USB chargers. Saves me having to use endless amount of multi socket extensions.The ZedLabz one works great. There was another one linked in the thread (the £1 odd one) that has a 1* review saying it broke the user's charging port - I fully agree that buying something with a review like that would be silly and an unnecessary risk. Nintendo released their own USB cable charger haven't they? It's the same as others now. In defence, no one has really said they're using a cheapo mains charger … In defence, no one has really said they're using a cheapo mains charger like in the article. Why is the photo in the post of an official Nintendo charger? The one in Argos isn't the same/ not official one.